The rate at which health care costs are rising had slowed down in recent years, and perhaps not unexpectedly, Obama's economic advisers have sought to draw the link that "As ACA Implementation Continues, Consumer Health Care Cost Growth Has Slowed." But an array of evidence suggests that something beyond that legislation--which after all, is mostly not yet implemented--is the cause. 1) The slowdown in the rise of health care spending was already being noted in newspaper articles back in early 2012. Writing in the New England Journal of Medicine in August 2012, Charles Roehrig, Ani Turner, Paul Hughes-Cromwick, and George Miller trace the timing and causes of the slowdown in "When the Cost Curve Bent — Pre-Recession Moderation in Health Care Spending." They write: "Spending for physician and clinical services has grown particularly slowly since the curve bent in 2005. In the pre-recession period, we trace this slowdown to slow growth in physician-payment rates relative to overall prices in the economy. In the post-recession period, payment-rate increases have remained low and the growth in the utilization of physician services has diminished." The authors acknowledge that the recession may also have contributed to a slower rise in health care spending, but they believe earlier structural factors--not yet well-understood--played a bigger role. 2) The slowdown in rising health care costs since the recession is international, as a press release with the OECD Health Report 2013 explains. 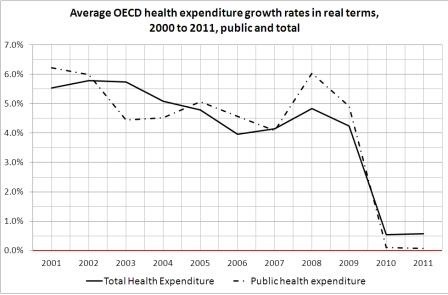 Here's a figure showing the rise in health care costs across OECD countries in recent years: notice in particular that the drop in public-sector spending on health care is greater than the drop in overall spending. 3) There's some reason to be dubious as to whether the slower rate of growth in health care spending will persist. Only a year ago, government actuaries were predicting that the rise in health care costs would pick up again as the economy accelerated, and total health care spending would rise from $17.8% of GDP in 2009 to nearly 20% of GDP by 2021. In short, the case that the 2010 U.S. health financing reform legislation is already playing a substantial role in holding down health care costs seems weak. It seems clear that the recession held down the rise in health care costs both in the U.S. and in many other countries. And there's some reason to believe that the rise in U.S. health care costs may be slowing--although the evidence remains preliminary. If the rise in health care costs is slowing down, and the health care cost curve is indeed bending, it would be huge news. For households, "Health Care Costs are Eating Your Pay Raise," as I posted back in January 2012. For government, rising health care costs for current employees, for the poor, and for retirees are the major drivers of why budget deficits are projected to become so very large in the next few decades. In almost every high income country, the share of 25-34 year-olds with higher education is higher than that for the age 25-64 population as a whole--about 7 percentage points higher. This is the pattern one would expect to see if a country is expanding access to higher education. But the U.S. is an exception, where the share of 25-34 year-olds with with a tertiary education degree is lower than for the age 25-64 population. 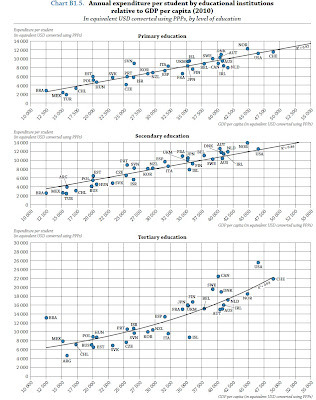 Here's an illustrative figure, taken from Education at a Glance 2013, published by the OECD, and freely available with a slightly clunky browser here. Although the U.S. used to lead the world share of adults with tertiary education few decades back, the figure shows that this is no longer the case. There's no reason to expect this to change in the next few years. When it comes to graduation rates from upper secondary school, the U.S. now falls below the OECD average. Similarly, if you look at the share of students who are going to enter tertiary education and emerge with a degree, the U.S. falls below the OECD average. The issue here doesn't seem to be primarily one of underspending. The U.S. has above-average spending per student by OECD standards--but this is expected, because the U.S. also has higher income levels, and so paying salaries to teachers will cost more. The following graph shows per capita GDP on the horizontal axis and spending per student on the vertical axis. 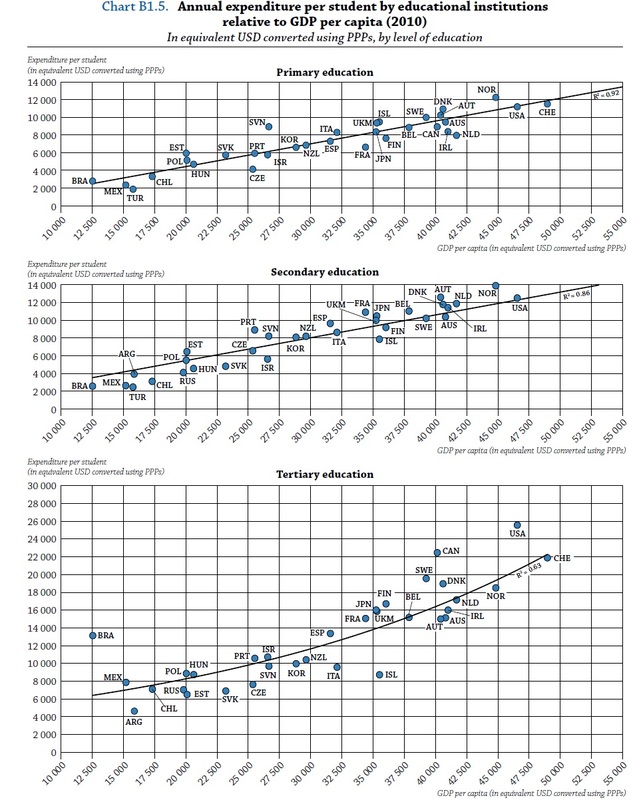 The best-fit line drawn through the graph shows the average pattern of how education spending rises with a country's per capita income. For primary education and for secondary education, the U.S. spending levels are right on the best-fit line. For tertiary education, the U.S. is noticeably above the line--that is, we spend more than one would expect given U.S. per capita incomes. Thus, the most obvious story told by these data is a frustrating one for the U.S. education system: Spending is roughly where it should be, but performance is lagging badly. U.S. firms are holding $1.8 trillion in liquid assets: that is, either cash or marketable securities. What's going on here? Laurie Simon Hodrick tackles the question, "Are U.S. Firms Really Holding Too Much Cash?" in a July 2013 Policy Brief written for the Stanford Institute for Economic Policy Research. For background, here are a couple of figures. 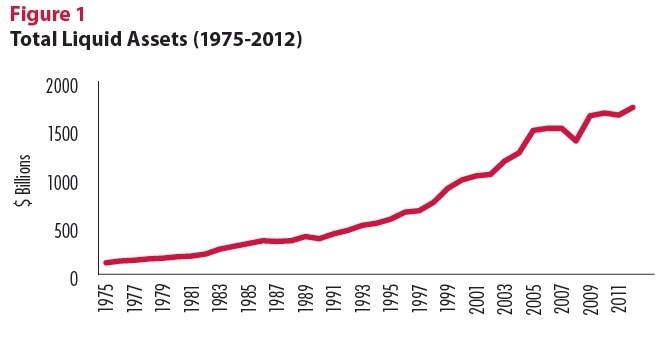 The first shows cash and marketable securities of firms over time--that is, "liquid assets"--rising rapidly. The second shows these liquid assets as a share of the short-term liabilities of firms. Of course, firms always like to have some cash on hand, but historically, that has been about 30% of all short-term liabilities. In the last few years, liquid assets have climbed to almost half of all short-term liabilities. The argument usually heard for holding additional liquid assets is that the last few years have been times of considerable uncertainty about the economy and economic policy, so firms need a bigger cushion. This explanation has some truth in it, but it's not all of the truth. 1) This need for additional liquid assets is not affecting all firms or all industries equally, but instead is affecting a smaller number of highly profitable companies. 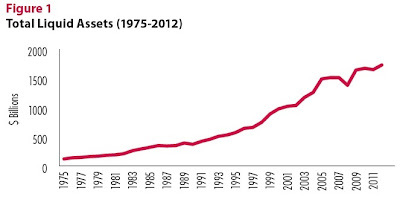 For example, non-financial firms in the S&P 500 hold about $1.3 trillion in liquid assets. As Hodrick explains: "Five companies, General Electric, Microsoft, Google, Cisco, and Apple, account for 25 percent of the $1.27 trillion, while 22 companies account for half of it. ... [C]ash holdings are concentrated among highly profitable firms, many in the technology and health care sectors." 2013." It's especially interesting, or ironic, that waiting to bring foreign earnings back to the U.S. for tax purposes doesn't preclude investing those funds in the U.S. economy--just like any other foreign investor can do. Hodrick writes: "It is also important to recognize that the “overseas” money owned by foreign subsidiaries need not be invested abroad, but instead can be held at U.S. banks, in U.S. dollars, or invested in U.S. securities. For example, according to SEC filings, $58 billion of Microsoft’s total cash holding of $66.6 billion is held by foreign subsidiaries. Surprisingly, about 93 percent of Microsoft’s cash held by foreign subsidiaries in 2012 was invested in U.S. government bonds, corporate bonds, and mortgage-based securities. The assets of Apple Operations International, Apple’s Irish subsidiary, are managed in Reno, Nevada, by employees at one of its wholly owned subsidiaries, Braeburn Capital, according to a Senate report, with the funds held in bank accounts in New York." 3) There's a long tradition in the economics and corporate finance literature of being suspicious about firms that hold large amounts of cash. After all, large amounts of cash on hand might help the job security and emotional comfort of the managers, but not necessarily be in the best interests of shareholders. There's an argument that cash-heavy firms should either have a plan for at least potentially investing that cash in a project that will increase future company profits, or a plan for paying it out to shareholders. I confess that I find it a little refreshing when firms hold large amounts of cash. It hints at a certain discipline on the part of management that they are waiting for an opportunity. Saying that you need a cash reserve to take advantage of unexpected opportunities sounds great--but after a few years of doing this, shouldn't firms be able to point to a series of actual unexpected opportunities of which they did take advantage? ever authorized." However, by some estimates this payout will only be enough to keep Apple's overall cash hoard from increasing--not actually to diminish it. The US labor market has been improving from dismal to sluggish, and the overall unemployment rate has been drifting down. But it's worth remembering that after five years of sustained high unemployment, the unemployed are disproportionately those who face the issues of long-run unemployment in a way that the U.S. economy has not seen in its post World War II experience. Here's a snapshot of the unemployment rate over time, generated with the ever-useful FRED website maintained by the Federal Reserve Bank of St. Louis. The sharp rise in unemployment during the Great Recession is striking, but what I want to focus on here is the amount of time that the U.S. economy has been experiencing an unemployment rate above 7.5%. Draw a mental line across the graph at 7.5% and take a look. The unemployment rate was above 7.5% for (almost all of) 26 months from January 1975 to February 1977. It was also above 7.5% for (almost all of) 51 months from May 1980 to August 1984. But since the unemployment rate rose above 7.5% in January 2009, it's now been above that level for 54 months and counting. Also, the graph shows that the spike in unemployment in the early 1980s was "sharper," meaning that unemployment rates weren't at the very highest levels then for as long a time as they have been in the last few years. One result is that a far higher share of the unemployed have been unemployed for 27 weeks or more than at any time since the end of World War II. In the past, the long-term unemployed typically made up 20-25% of total unemployment during recessions. In the Great Recession, the long-term unemployed were about 45% of the total unemployed, and the share of total unemployment accounted for by the long-run unemployed remains historically high. A similar pattern emerges when looking at the average duration of unemployment. In past decades, this measure usually spiked up to about 15-20 weeks of unemployment in tough times. But in the aftermath of the Great Recession, the average duration of unemployment spiked up to 40 weeks, and even now is at a historically sky-high 35 weeks. 1) As someone on a college campus, where the undergraduates rotate in and out over four years, we have now reached a situation where entire classes of students have entered as freshmen during a terrible labor market and exited as seniors into a terrible labor market. This inevitably has an effect on how they perceive the costs and benefits of college, how their families see it, and how rising high school students see it. 2) It seems plausible that the long-term unemployed have a harder time getting jobs than those who are more recently unemployed. In part, this may be that the long-term unemployed are less motivated or less attractive as employees--which is part of the reason they are long-term unemployed. After all, unemployed workers lose human capital: that is, they lose a chance for job experience and to keep their skills updated. But in addition, part of the reason is probably that employers make assumptions that the long-term unemployed are less likely to be desireable workers. When the labor market has been so poor for so long, such an assumption by employers is less justifiable than it would have been in the past. 3) In short, those who are currently unemployed, as a group, are more likely to have experienced long-run unemployment than any previous group in post-World War II U.S. experience. Re-integrating these workers into the labor force is going to bring challenges and costs that I don't think employers, government, or workers themselves have yet thought through. At least as far back as the Luddite movement of the early 19th century, when those who has made textiles by hand protested against labor-saving machinery, workers have feared that they might be replaced by machines. As the capabilities of robots increase and unemployment rates remain troublingly high, this fear may seem even more immediate today. Frank Levy and Richard J. Murnane look at the interaction between workers and machinery in "Dancing with Robots: Human Skills for Computerized Work," written for the Third Way think tank. how specific tasks are performed." Levy and Murnane look at which occupations are growing (as a share of the labor force) over time, and which ones are shrinking. The picture looks like this: they argue that jobs with nonroutine physical work or unstructured cognitive work are hard to automate--and those are the kinds of jobs that are growing. 1) A worker with access to dishwashers can be far more productive than a worker who must do all six of the tasks by hand. But if your job was washing, rinsing and drying dishes by hand, you could be out of luck. The the challenge for all 21st century workers is to find ways of being the one who uses technology and robots to magnify the productivity of the tasks that you do, not being the one who does tasks that can be replaced by a robot. In the economics jargon, you want technology to complement your work, not to substitute for it. 2) Back in the Stone Ages when I was in junior high school, we were all required to take "shop" classes in woodworking, metal-working, electrical circuits, and graphic drawing. While it remains important for students to have a grip on how material things work, someone who was relying on that kind of education would have experienced a miserable job market in the last few decades. Indeed, a large number of workers were educated in the 1950s, 1960s, 1970s and 1980s for jobs that barely existed by the end of the 20th century. The 21st century equivalent means knowing how things work, but also being able track down relevant information and make sense of it in solving problems that arise. Helping students memorize routines for addressing a task isn't a path to career advancement, because if a task can be reduced to a routine, it can also be automated. This calls for a shift in the educational system that is subtle, but substantial in teaching what Levy and Murnane call "foundational skills." 3) At least to me, the bottom line for all concerns about machinery replacing workers is that if this was a big problem, surely it would have already been happening steadily during the last two centuries? It's easy to make the case that machinery and robots alter what workers do, and that it will shake up occupations and wages, but it flies in the face of two centuries of history to argue that mechanization will lead to mass unemployment. According to World Bank estimates, Mexico's total GDP ranked 14th among the countries of the world in 2012, just behind Spain and just ahead of South Korea--and with an economy more than double the size of Sweden, Poland, or Argentina. But while Mexico is a light-heavyweight in the world economy as measured by total size of its economy, it's also an economy that has had disappointingly sluggish growth in recent decades. Jesús Cañas, Roberto Coronado and Pia Orrenius summarize the results of a conference held last fall at the Federal Reserve Bank of Dallas on these issues in "Will Reforms Pay Off This Time? Experts Assess Mexico’s Prospects," published in the Second Quarter 2013 issue of Southwest Economy. As a starting point, here are some background figures. 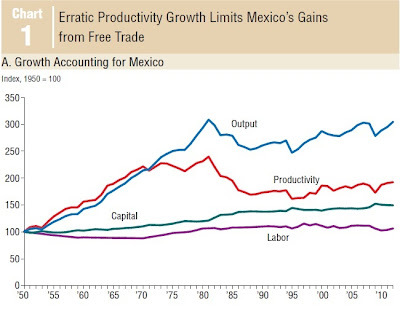 The top line shows the path of output in Mexico since 1950: note the sharp rise from 1950 up to about 1980, the proverbial "lost decade" for Mexico's economy in the 1980s, and the modest rebound since the mid-1990s. The other lines show the underlying causes behind those patterns: Mexico's economy basically tracks the path of productivity growth, which has been sluggish for the last few decades. Here is a figure showing the per capita standard of living in Mexico, generated by the ever-useful FRED website run by the Federal Reserve Bank of St. Louis. During the period of rapid growth from 1950 to 1980, per capita GDP more-or-less tripled. The economic ground lost during the 1980s wasn't recouped until the late 1990s. Mexico's per capita growth has been about 1.1% annually over the last 25 years, which isn't a large amount for an emerging economy, and it's been a bumpy economic road to get there. For a sense of Mexico's bumpy economic road, here's one more figure generated from the FRED website. This shows annual rates of real GDP growth. Notice that even after Mexico's "lost decade" of the 1980s, it experienced brutally deep recessions in 1996 and again in 2008. The underlying story in Mexico seems to be that of an economy which has opened dramatically to international trade, but hasn't run into two problems. One is competition from China. The authors quote Gordon Hanson to the effect that Mexico has the misfortune of "producing what China produces and not what China buys." But China's competitive challenge to Mexico appears to be diminishing as wages in China increase dramatically. The bigger constellation of economic problems for Mexico is not reforming its economy in ways that would help to stimulate productivity growth. The essay cites a number of issues here: dysfunctional credit markets that don't get funds to small and medium-sized firms; inefficient infrastructure companies, including telecommunications, transportation, electricity, and energy; an inflexible labor market with many workers stuck in informal employment. The article describes evidence from Fausto Hernandez Trillo, a professor at Centro de Investigación y Docencia Económicas in Mexico City: "Only one-fifth of the 3.7 million firms in Mexico are in the tax-paying formal sector. 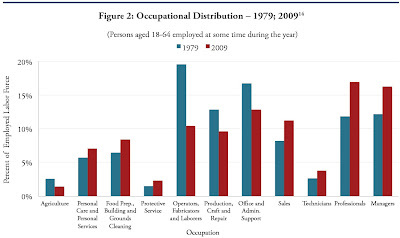 The remainder makes up the informal economy, which accounts for 72 percent of private sector employment. “There are two Mexicos,” Hernandez Trillo said, “a modern, productive formal sector with large firms, and a poor informal sector dominated by small, unproductive firms.” The national oil company, Pemex, is a cash cow for the national government, and thus lacks money to invest in locating and developing energy resources. To me, one of the most striking figures discussed in the paper is from Stephen Haber, looking at Mexico's political history. With the widely-used "Polity" scoring method, he looks at the level of democracy in Mexico over time. This scale runs from 0 to 100, with pure dictatorship at 0 and anything above 85 counting as "democracy. 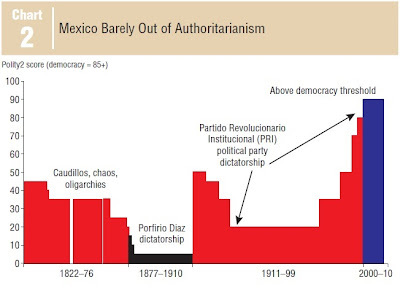 By Haber's estimate, Mexico only really crossed into become a democracy about a decade ago. In some sense, Mexico's main economic challenge is political--that is, it involves the question of how to undertake the legal and institutional changes that will encourage innovation and productivity growth in a way that reaches throughout Mexico's entire economy. Many people know of the first wave of economic globalization that occurred in the last few decades of the 19th century and ended with the onset of World War I. After World War II, globalization got started again. But up to about the early 1990s, merchandise trade as a share of world GDP was still climbing back to where it had been circa 1913. The globalization of economic activity since then is truly unprededented. Arvind Subramanian and Martin Kessler discuss "The Hyperglobalization of Trade and Its Future" in a July 2013 working paper written for the Peterson Institute for International Economics. Here's an overview figure showing the pattern of first globalization, deglobalization, reglobalization, and now hyperglobalization. 1) One reason for the surge in trade can be traced to the rapid growth of emerging economies that are intertwined with world trade, especially China, but also India, Brazil, and others. 2) Earlier surges in world trade have been driven to some extent by cheaper transportation costs. However, this particular surge of world trade seems to have more to do with cheaper information and communications costs. One manifestation of cheaper costs of information transmission is the rise in services trade, shown by the green line in the figure. Indeed, the authors argue that if one count services that accompany the trade in goods, then trade in services would be about 50% larger. Another manifestation is the rise in trade of unfinished products like parts and components, which flow back and forth across national borders as global supply chains become longer. Just looking at trade in value-added terms, as shown by the red dashed line in the figure, there is still a sharp rise--but not as large as the overall rise in trade. Still another manifestation is the rise in foreign direct investment, which can be thought of as applying management services from one country to production in another country. 3) Overall, world trade is facing increasing barriers. One reason is that the volume of trade is shifting to emerging economists, which on average have greater trade barriers than the high-income countries. Another reason is that trade is shifting to services, and trade barriers in areas like finance, professional services, retailing, and transportation are higher than in manufacturing. Still another reason is the proliferation of regional trade agreements, which ease trade barriers within a region at the cost of making remaining trade barriers against the rest of the world loom larger. 4) As the U.S. economy struggles to return to an acceptable rate of growth, one obvious mechanism is to find ways to hook into the very rapid growth happening in emerging economies around the world. But this may well require both domestic policy changes to help U.S. workers adjust to the inevitable dislocations of international trade, and international changes so that world trade involving new trading partners, a rising level of services and foreign direct investment, and ever-longer production chains is conducted under a set of common rules that are at least clearly spelled out. Every teacher of economics needs examples of shortages: more specifically, examples of a situation in which the quantity demanded exceeds the quantity supplied at the prevailing market price. Robert S. Goldfarb is on the job with examples and insights in "Shortage, Shortage, Who's Got the Shortage?" in the most recent issue of the Journal of Economic Education (44: 3, pp. 277-297). Goldfarb provides six categories of shortages, and offers examples of points to make in the classroom and possible quiz or discussion questions for each. Useful examples here are popular Christmas toys, where quantity demanded runs ahead of quantity supplied as the big day approaches. Examples over the years include Zhu Zhu Pets in 2009, Tickle Me Elmo in 1996, Transformers in 1984, Cabbage Patch Kids in 1983, and all the way back to Shirley Temple dolls in 1934. Goldfarb also suggests flu shots as an example of shortages in this category. An example here would be tickets to popular performances or athletic events, from the Super Bowl to Bruce Springsteen, and even popular restaurants that choose to book fully or have lines rather than to raise prices. The reason for such behavior is usually phrased in terms that consumers feel better about a seller who doesn't extract the highest possible dollar value, even when that same consumer may be paying for a higher-priced ticket sold by a re-seller or scalper. A homely classroom example here would be the price of parking, which in many cities is set so that quantity demanded exceeds quantity supplied. More complex examples include the price of traffic congestion, which is often set at zero, but even on many toll roads is not set in a way that eliminates congestion. In certain industries, like airlines and hospitals, the provider needs to make a decision in advance about what total quantity to provide. In these cases, it will usually make sense for the provider not to set up capacity for the highest likely spike in demand, because that would mean too much unused capacity at other times. Also, there are often some users of airlines and hospitals who can shift demand across time if necessary. As Goldfarb notes, it's probably not useful to have a greatly expanded discussion of shortages in the supply-and-demand part of a class. My own experience is at some point, after about the third example, students experience the MEGO ("my eyes glaze over") effect. But many of these kinds of examples can be used in discussions of slow adjustment speeds, government regulation, difficulties of forecasting the future, and the like. Thus, they offer ways of strengthening the earlier supply-and-demand lessons about shortages in later parts of the class. "Personally, I've never been a cheapskate. I'm not a free spender, mind you, but I do buy decent clothes from mid-level chains like Banana Republic, would probably pay a doctor to save my son's limbs if the kid asked nicely, and unless the waiter spills cappuccino on my lap or tells me I look like Lyle Lovett, have always given a respectable, 15 percent tip. "I'd say I'm right in the middle of the stinginess scale. Or I was. The Britannica has nudged me to be ever so slightly less cheap. For the last few weeks, I've started tipping more, in the range of 20 to 25 percent. That's one clear-cut--if very small--way the Britannica has changed me, probably for the better. I noted the change after reading about marginal utility theory in the economics section. I probably learned all about marginal utility theory in college, but it didn't sink in, just as most things in college didn't sink in, unless they involved new and more efficient ways to get hammered. "For those foggy on their microeconomics: marginal utility theory says that consumers differ in the amount of satisfaction they derive from each unit of a commodity. When a man with only seven slices of bread gets offered another slice, that one extra slice gives him a lot of happiness. But if a man has a couple of hundred slices of bread--enough bread to keep him waist-deep in sandwiches for months--another slice of bread won't send his spirits soaring. "In short, money means more to those who don't have it. I know this verges on common sense. But there's something about seeing it in the Britannica, expressed as a rock-hard economic law, that makes it more powerful to me. So, for instance, today, when I took a cab home in the snow, even though the driver tested my nerves by spending the entire time telling me about his favorite Dunkin' Donuts flavors (he's partial to crullers), I gave him $6 instead of the usual $5. I probably have more money than he does in my bank account, so the dollar will provide him with greater happiness than it would me. A simple, logical conclusion. I know it smacks of noblesse oblige, of extreme condescension. But I don't care--it make me feel better. Of course, the right thing to do would be to give away 90 percent of my bank account, but what can I do? I like my Banana Republic khakis and my cappuccinos." Here's a sure-to-be-unpopular but quite defensible conversation-starter: All placards that allow those with disabilities to park for free should be eliminated. For overviews of this argument, see "Parking without Paying," by Michael Manville and Jonathan Williams in the Spring 2013 issue of Access magazine, and "Ending the Abuse of Disabled Parking Placards," by Donald Shoup, in the Fall 2011 issue of Access, which is published by the University of California Transportation Center. "The government isn’t going to hand out free gasoline anytime soon, but at least 24 states and many local governments do distribute free parking passes, in the form of disabled placards. These placards not only grant access to spaces reserved for people with disabilities, but also let their holders park free, often for unlimited time, at any metered space. Nor are placards difficult to get. In California, for example, doctors, nurses, nurse practitioners, optometrists and chiropractors can all certify people for placards, for everything from serious permanent impairments to temporary conditions like a sprained ankle. We recommend that cities and states limit or eliminate free parking for disabled placards. We believe the payment exemption has high costs and few benefits. It harms both the transportation system and the environment, and offers little help to most people with disabilities." A number of counts in various cities have found very high use of disability placards that allow for free parking. Manville and Williams mention a 2010 count in Oakland which found that 44% of parking spaces were filled by cars displaying a disability placard. In their own survey of 5,000 parking meters in Los Angeles, 27% were filled by cars not paying, but displaying a disability placard. Moreover, the cars with disability placards often stayed much longer than other vehicles. A 2010 study in Alexandria, Virginia, found that 90% of disability placards were being used inappropriately. 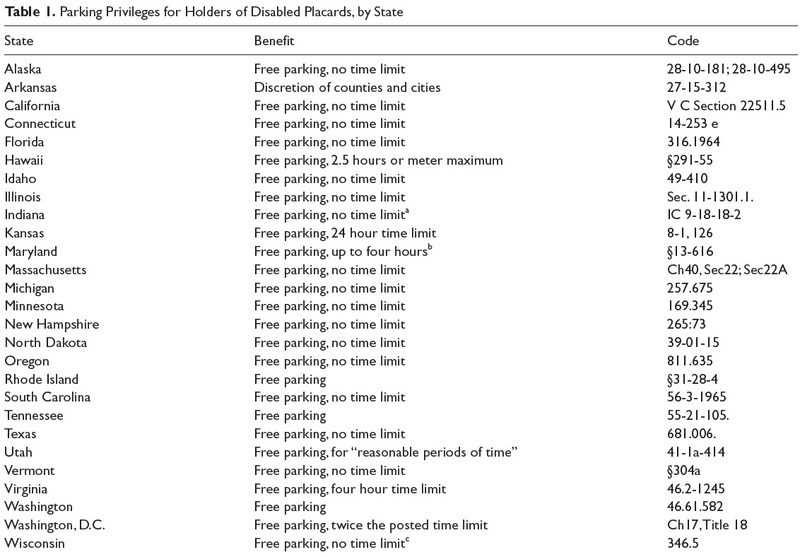 In my own hometown of Minneapolis, the city council tightened up the rules on disability parking placards in 2002, when it was estimated that about half of the metered parking spots downdown every workday were occupied by cars with handicapped permits, costing the city up to $1 million in parking revenue each year. There are some middle-ground solutions here. Donald Schoup explains one: "In 1998, Arlington [Virginia] removed the exemption for placards and posted "All May Park, All Must Pay" on every meter pole. Because it is easier to pull into and out of the end space on a block, Arlington puts meters reserved for drivers with disabilities at many of these end spaces. The purpose is to provide parking in convenient locations for people with disabilities, not to offer a subsidy that invites gross abuse. Cities can reserve the most accessible meter spaces for disabled placard holders, but accessible is not the same as free." Another proposal is that if those who are disabled need more time while parking, they can have cards that allow them to stay longer at a given spot--but still to pay for the full parking time they use. Instead of free parking, collect the revenue and use it to give those with disabilities taxi vouchers or other transit services. 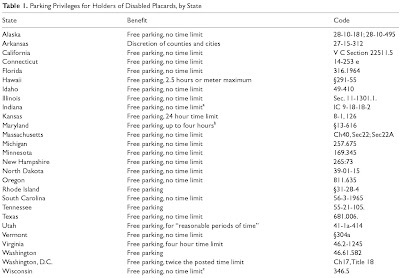 From a 2012 research paper by Manville and Williams in the Journal of Planning Education and Research, here's a list of the states that have free parking for those with disability permits. The list does not include municipal-level rules: for example, New York City offers free parking to those with disability permits, but the state of New York does not. Anyway, here's their list. I'm not someone who calls for ever-tighter protection of intellectual property. Even when intellectual property raises profits for innovators and producers in the short-run, the ultimate goal is lower prices and new products for consumers in the long run. I've even speculated that the very term "intellectual property" may be a misnomer, encouraging an inappropriately strong idea of what patents and copyrights are intended to accomplish. "It is difficult to overstate the importance of intellectual property to U.S. economic prosperity and difficult to gauge the full extent of the damage done by IP [intellectual property] theft. ... A 2012 study by the Department of Commerce found that protection and enforcement of IPR around the globe directly affects an estimated 27 million American jobs in IP-intensive industries, which is roughly 19% of the U.S. workforce, producing over one-third of America’s GDP. goes on. ... Totaled, it is safe to say that dollar losses from IP theft are hundreds of billions per year, which is at least in the range of total exports to Asia in 2012 (valued at $320 billion). Indeed, IP is hugely important to the U.S. economy. Loss of revenues to the victimized inventor or owner of a trade secret is the first and most obvious cost of IP theft, but an asset is lost too. Both losses mean fewer jobs and less money to reinvest in the next generation of products. Stolen IP represents a subsidy to the party that did not have to bear the costs of developing it, and the effects can ripple across industries and companies." Looking at a range of estimates, the Commission argues that China accounts for about 70% of the theft of intellectual property. It points out that with long global supply chains, and sluggish enforcement, intellectual property is at ever-greater risk. It's clearly a counterproductive state of affairs that prevents U.S. companies from using the intellectual property of their competitors, but then makes them compete against Chines producers who have gained access to that same intellectual property without a license or payment. What's to be done? This commission was co-chaired by Dennis C. Blair (former Director of National Intelligence and Commander in Chief of the U.S. Pacific Command and Jon M. Huntsman (former Ambassador to China, Governor of the state of Utah, and Deputy U.S. Trade Representative). It's proposals are mainly for greater government attention and enforcement for these issues, including everything from investing in cybersecurity measures to requiring that imported products show that their supply chain used intellectual property fairly. While such recommendations are sensible enough, they do run a risk that the U.S. government becomes an agent pushing solely for higher royalty profits for U.S. innovators and producers, without taking into account how the diffusion of new technologies can benefit consumers. Trying to enforce U.S. standards of intellectual property protection around the world for all products is going to be costly and cumbersome, at best. Improved protection of intellectual property is a worthy goal, but we also need to be rethinking more broadly how to encourage U.S.-based innovation in a competitive global economy that is not always going to play by U.S. rules with a variety of policy tools, including government-supported research and development, training of researchers, tax breaks for corporate research and development, and a U.S. business climate that is supportive for new U.S. firms. Student Loans: An Economic Anchor? In the past, those with student loans had more debt that those without such loans, but also had similar credit scores and were more likely to have a home loan or a car loan. The reason, of course, is that hose with student loans also are more likely to have attended colleges and universities, and the improved job prospects from higher education in some sense outweighed the student loan debt. But now the pattern has altered, as Meta Brown and Sydnee Caldwell of the New York Federal Reserve report. Here are a couple of illustrative figures looking at home loans and car loans. Notice that up to about 2008, those with student debt were more likely to have home and car loans. Since then, they have become slightly less likely to have such debt. Here's a figure, showing credit scores for 25 and 30 year-olds, with and without student debt. Notice that up to about 2008, credit scores were similar for those with and without student debt--essentially, the higher level of debt for those with student loans, who were also more likely to have home and car loans, was counterbalanced by their higher earning power. But since 2008, the credit scores of 25 and 30 year-olds without student debt have risen, while those with student debt have been flat or slightly declining. Of course, these numbers are averages. Probably the key fact to remember about student debt is that there is enormous variation in the payoff to higher education depending on the school you attend, your major, whether you complete a degree, and other factors. For previous posts on student loan issues, see "Student Loan Snapshots" (March 4, 2013) and "Average College Student, Average Loan"
When it comes to worrying about future financial dangers, Raghuram Rajan has a track record. Back in 2005, he presented a paper at a high-profile conference of central bankers called, "Has Financial Development Made the World Riskier?" He answered "yes," and took a lot of criticism for a few years--before the financial crash and Great Recession from 2007-2009 largely proved him right. "Two competing narratives of the sources of the crisis, and attendant remedies, are emerging. The first, and the better known diagnosis, is that demand has collapsed because of the high debt build up prior to the crisis. ... But there is another narrative. And that is that the fundamental growth capacity in industrial countries has been shifting down for decades now, masked for a while by debt-fuelled demand. More such demand, or asking for reckless spending from emerging markets, will not put us back on a sustainable path to growth. Instead, industrial democracies need to improve the environment for growth. The first narrative is the standard Keynesian one, modified for a debt crisis. It is the one most government officials and central bankers, as well as Wall Street economists, subscribe to, and needs little elaboration. The second narrative, in my view, offers a deeper and more persuasive view of the blight that afflicts our times." Rajan argues that the extraordinary steps taken by the Federal Reserve and other central banks in the heat of the financial crisis and recession was brave and correct. However, he points out that the policies of ultra-low interest rates since the end of the crisis have not restored the economy to health, and worries about some of the risks and problems that are being stored up. "Hindsight is 20–20. It now seems obvious that central banks should have done what they did then, but in many ways, the central banks were making it up as they went. Fortunately for the world, much of what they did was exactly right. They eased access to liquidity through innovative programs such as TALF, TAF, TARP, SMP, and LTRO. By lending long term without asking too many questions of the collateral they received, by buying assets beyond usual limits, and by focusing on repairing markets, they restored liquidity to a world financial system that would otherwise have been insolvent based on prevailing market asset prices. In this matter, central bankers are deservedly heroes in a world that has precious few of them. ... Be that as it may, the second stage of the rescue was to stimulate growth with ultra-low interest rates. And thus far, the central banks have been far less successful." "Churchill could well have said on the subject of unconventional monetary policy, “Never in the field of economic policy has so much been spent, with so little evidence, by so few”. Unconventional monetary policy has truly been a step in the dark." "[F]inancial risk taking may stay just that, without translating into real investment. For instance, the price of junk debt or homes may be bid up unduly, increasing the risk of a crash, without new capital goods being bought or homes being built. ... As just one example, the IMF’s Global Financial Stability Report (Spring 2013) points to the re-emergence of covenant lite loans as evidence that greater risk tolerance may be morphing into risk insouciance. "[A]ccommodative policies may reduce the cost of capital for firms so much that they prefer labor-saving capital investment to hiring labor. ... Excessive labor-saving capital investment may defeat the very purpose of unconventional policies, that is, greater employment. Relatedly, by changing asset prices and distorting price signals, unconventional monetary policy may cause overinvestment in areas where asset prices or credit are particularly sensitive to low interest rates and unanchored by factors such as international competition. For instance, the economy may get too many buildings and too few machines, a consequence that is all too recent to forget." "The spillovers from easy global liquidity conditions to cross-border gross banking flows, exchange rate appreciation, stock market appreciation, and asset price and credit booms in capital receiving countries – and eventual overextension, current account deficits, and asset price busts has been documented elsewhere, both for pre-crisis Europe and post-crisis emerging markets." Politicians may avoid taking necessary reforms, because they unwisely believe that central bankers have all the tools necessary to bring long-term economic health. unconventional monetary policies that we know little about." 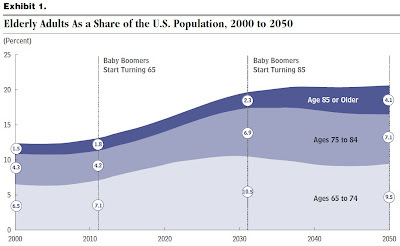 As America's population ages, many more elderly people are going to need services and supports, ranging from a little help at their own home to community based care, residential care facilities, and skilled nursing home care. The Congressional Budget Office usefully lays out the issues in its June 2013 report, "Rising Demand for Long-Term Services and Supports for Elderly People." The starting point, of course, is that the U.S. population is aging. 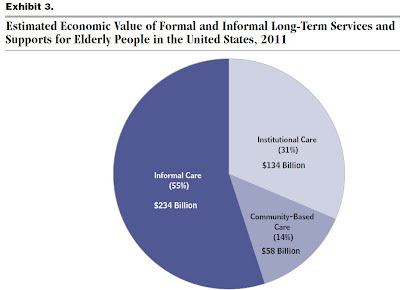 At present, the majority of the value of the provision of long-term care services is provided by "informal care"--that is, care provided without compensation by family and friends. The CBO estimated the value of this care by looking at estimates of the number of hours involved, and then valuing that time at $21/hour, which is roughly the average cost of hiring someone to provide this kind of care. As the proportion of older adults climbs, especially those over 85, many of them are going to need greater assistance. 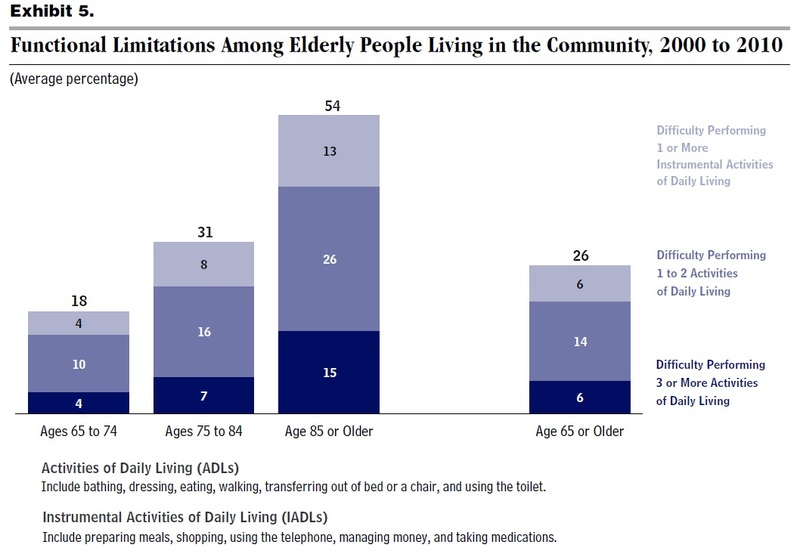 Here's an estimate of the need for assistance among elderly people living in the community--that is, not those who need residential or skilled nursing home care. With more people living longer and with fewer children than previous generations, informal care is unlikely to be able to meet the growing need for these services. 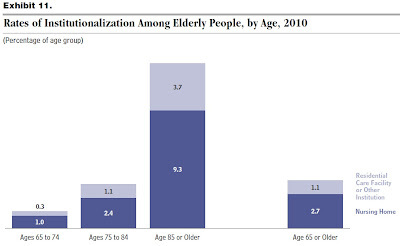 Of course, as people become older they are more likely to need institutionalized care, as well. I'm not at all sure how best to start building social institutions to address these coming needs, but here are some thoughts. 1) It would of course be best if most people could make some provision for the costs of their own care. But many Americans don't have much in savings. And getting people to buy long-term care insurance is a tough sell, in part because it's unclear how this care will be provided several decades in the future and what it will cost, and in part because Medicaid eventually steps in and covers nursing home care for those whose assets are depleted--which gives people less incentive to buy private insurance. In fact, more than half of the current nursing home residents in the U.S. are having their bills paid by Medicaid. For more discussion, see this post on "Long-Term Care Insurance in the U.S."
2) Some other high-income countries have government programs to pay for long-term care. Not surprisingly, they spend a substantially greater share of GDP on long-term than does the U.S. In any event, the long-term U.S. budget picture is grim enough that adding another entitlement for the elderly isn't likely. For more discussion, see "Long-Term Care in International Perspective." 3) It's typically much less expensive if the elderly can continue to live in the community, whether in their own home or in some kind of community residence. CBO reports: "In 2011, the annual cost of care for a resident paying either out of pocket or with private insurance in a semiprivate room in a nursing home averaged nearly $80,000." Living in the community is also what most of the elderly prefer. Thus, the challenge is how to retrofit homes to be safe for the elderly, and to start planning and setting up a network of community-based residences near shopping, libraries, parks, public transit, and health care, and providing a network of services, but in a way that continues to encourage the provision of informal care and support by family and friends. It will be difficult to draw this balance. 4) Much depends on the health status of the elderly a few decades from now. If the elderly not only live longer but remain relatively active and healthy, then that should lead to one blueprint for long-term care. If the elderly start living much longer, and if their health becomes especially frail for many years, another blueprint for long-term care will be needed. Again, I don't have a clear blueprint in my own mind for how to address these issues. But it is virtually certain that the need for long-term care for the elderly is going to rise dramatically, and pushing most of them into Medicaid-funded nursing homes is unlikely to be the best answer. For economists around the world, 1776 means the publication date of Adam Smith's classic The Wealth of Nations. Book IV, Chapter 7, is entitled "Of Colonies." Smith expresses the view that Europe contributed very little to the economic success of its American colonies--except for some talented people. He also believed that the while England benefited from trade with its colonies, England also had to bear the costs of defense and of the monopolies on trade that it created. He painted a picture of how the American colonies might be allowed democratic representation, but viewed it as a politically unlikely outcome. He also predicted that even when a nation didn't benefit from having colonies, it was still reluctant to let the colonies go peacefully. The quotations here are from the ever-useful "Library of Economics and Liberty," which has number of classic works of economics freely available in searchable form on-line. "The English Puritans, restrained at home, fled for freedom to America, and established there the four governments of New England. The English Catholics, treated with much greater injustice, established that of Maryland; the Quakers, that of Pennsylvania. The Portugueze Jews, persecuted by the Inquisition, stripped of their fortunes, and banished to Brazil, introduced by their example some sort of order and industry among the transported felons and strumpets by whom that colony was originally peopled, and taught them the culture of the sugar-cane. Upon all these different occasions it was not the wisdom and policy, but the disorder and injustice of the European governments which peopled and cultivated America. ..."
"When those establishments were effectuated, and had become so considerable as to attract the attention of the mother country, the first regulations which she made with regard to them had always in view to secure to herself the monopoly of their commerce; to confine their market, and to enlarge her own at their expence, and, consequently, rather to damp and discourage than to quicken and forward the course of their prosperity. In the different ways in which this monopoly has been exercised consists one of the most essential differences in the policy of the different European nations with regard to their colonies. The best of them all, that of England, is only somewhat less illiberal and oppressive than that of any of the rest." "In what way, therefore, has the policy of Europe contributed either to the first establishment, or to the present grandeur of the colonies of America? In one way, and in one way only, it has contributed a good deal. ... It bred and formed the men who were capable of achieving such great actions, and of laying the foundation of so great an empire; and there is no other quarter of the world of which the policy is capable of forming, or has ever actually and in fact formed such men. The colonies owe to the policy of Europe the education and great views of their active and enterprising founders; and some of the greatest and most important of them, so far as concerns their internal government, owe to it scarce anything else." "To found a great empire for the sole purpose of raising up a people of customers may at first sight appear a project fit only for a nation of shopkeepers. It is, however, a project altogether unfit for a nation of shopkeepers; but extremely fit for a nation whose government is influenced by shopkeepers. Such statesmen, and such statesmen only, are capable of fancying that they will find some advantage in employing the blood and treasure of their fellow-citizens to found and maintain such an empire. Say to a shopkeeper, Buy me a good estate, and I shall always buy my clothes at your shop, even though I should pay somewhat dearer than what I can have them for at other shops; and you will not find him very forward to embrace your proposal. But should any other person buy you such an estate, the shopkeeper would be much obliged to your benefactor if he would enjoin you to buy all your clothes at his shop. England purchased for some of her subjects, who found themselves uneasy at home, a great estate in a distant country. The price, indeed, was very small, and instead of thirty years purchase, the ordinary price of land in the present times, it amounted to little more than the expence of the different equipments which made the first discovery, reconnoitred the coast, and took a fictitious possession of the country. The land was good and of great extent, and the cultivators having plenty of good ground to work upon, and being for some time at liberty to sell their produce where they pleased, became in the course of little more than thirty or forty years (between 1620 and 1660) so numerous and thriving a people that the shopkeepers and other traders of England wished to secure to themselves the monopoly of their custom. Without pretending, therefore, that they had paid any part, either of the original purchase-money, or of the subsequent expence of improvement, they petitioned the parliament that the cultivators of America might for the future be confined to their shop; first, for buying all the goods which they wanted from Europe; and, secondly, for selling all such parts of their own produce as those traders might find it convenient to buy. ... A clause in the famous act of navigation established this truly shopkeeper proposal into a law." "In order, however, to obtain this relative advantage in the colony trade, in order to execute the invidious and malignant project of excluding as much as possible other nations from any share in it, England, there are very probable reasons for believing, has not only sacrificed a part of the absolute advantage which she, as well as every other nation, might have derived from that trade, but has subjected herself both to an absolute and to a relative disadvantage in almost every other branch of trade. ... "
Smith discussed various possibilities for how Great Britain might deal with its colonies. One proposal was that Great Britain should just "voluntarily give up all authority over her colonies," which would then allow Britain and America, in friendship to benefit from free trade between them. But he despaired of this possibility. "To propose that Great Britain should voluntarily give up all authority over her colonies, and leave them to elect their own magistrates, to enact their own laws, and to make peace and war as they might think proper, would be to propose such a measure as never was, and never will be adopted, by any nation in the world. No nation ever voluntarily gave up the dominion of any province, how troublesome soever it might be to govern it, and how small soever the revenue which it afforded might be in proportion to the expence which it occasioned. Such sacrifices, though they might frequently be agreeable to the interest, are always mortifying to the pride of every nation, and what is perhaps of still greater consequence, they are always contrary to the private interest of the governing part of it, who would thereby be deprived of the disposal of many places of trust and profit, of many opportunities of acquiring wealth and distinction, which the possession of the most turbulent, and, to the great body of the people, the most unprofitable province seldom fails to afford. The most visionary enthusiast would scarce be capable of proposing such a measure with any serious hopes at least of its ever being adopted. If it was adopted, however, Great Britain would not only be immediately freed from the whole annual expence of the peace establishment of the colonies, but might settle with them such a treaty of commerce as would effectually secure to her a free trade, more advantageous to the great body of the people, though less so to the merchants, than the monopoly which she at present enjoys. By thus parting good friends, the natural affection of the colonies to the mother country which, perhaps, our late dissensions have well nigh extinguished, would quickly revive. It might dispose them not only to respect, for whole centuries together, that treaty of commerce which they had concluded with us at parting, but to favour us in war as well as in trade, and, instead of turbulent and factious subjects, to become our most faithful, affectionate, and generous allies ..."
"The parliament of Great Britain insists upon taxing the colonies; and they refuse to be taxed by a Parliament in which they are not represented. If to each colony, which should detach itself from the general confederacy, Great Britain should allow such a number of representatives as suited the proportion of what is contributed to the public revenue of the empire, in consequence of its being subjected to the same taxes, and in compensation admitted to the same freedom of trade with its fellow-subjects at home; the number of its representatives to be augmented as the proportion of its contribution might afterwards augment; a new method of acquiring importance, a new and more dazzling object of ambition would be presented to the leading men of each colony. Instead of piddling for the little prizes which are to be found in what may be called the paltry raffle of colony faction; they might then hope, from the presumption which men naturally have in their own ability and good fortune, to draw some of the great prizes which sometimes come from the wheel of the great state lottery of British polities. "Unless this or some other method is fallen upon, and there seems to be none more obvious than this, of preserving the importance and of gratifying the ambition of the leading men of America, it is not very probable that they will ever voluntarily submit to us; and we ought to consider that the blood which must be shed in forcing them to do so is, every drop of it, blood either of those who are, or of those whom we wish to have for our fellow-citizens. They are very weak who flatter themselves that, in the state to which things have come, our colonies will be easily conquered by force alone. The persons who now govern the resolutions of what they call their continental congress, feel in themselves at this moment a degree of importance which, perhaps, the greatest subjects in Europe scarce feel. From shopkeepers, tradesmen, and attornies, they are become statesmen and legislators, and are employed in contriving a new form of government for an extensive empire, which, they flatter themselves, will become, and which, indeed, seems very likely to become, one of the greatest and most formidable that ever was in the world. ... Almost every individual of the governing party in America fills, at present in his own fancy, a station superior, not only to what he had ever filled before, but to what he had ever expected to fill; and unless some new object of ambition is presented either to him or to his leaders, if he has the ordinary spirit of a man, he will die in defence of that station." And of course, Smith's prediction, published in 1776 but largely written several years earlier, came true. To repeat, on this Fourth of July: "From shopkeepers, tradesmen, and attornies, they are become statesmen and legislators, and are employed in contriving a new form of government for an extensive empire, which, they flatter themselves, will become, and which, indeed, seems very likely to become, one of the greatest and most formidable that ever was in the world." "In fact, the need for theory is in some ways magnified by having large amounts of data. When you have a small amount of data, you can just look at the data and build your intuition from it. When you have very large amounts of data, just taking an average can cost thousands of dollars of computer time. So you’d better have an idea of what you’re doing and why before you go out to take those averages. The importance of theory to create conceptual frameworks to know what to look for has never been larger ... I think what is true is that when you have large amounts of data, if you ask it the right questions, you have a greater ability to let the data speak, and so you can be much less reliant on assumptions. But you still need a strong conceptual framework to understand what’s coming out. "And I would say in the business world, this is where there’s an enormous scarcity of talent. I see that there are a fair number of statisticians out there, not nearly enough, but a fair number of data scientists out there. There’s a huge demand for them still. But among data scientists, the ones who can define a question and introduce a new way of looking at the data—those data scientists are rock stars. They’re pursued by every company and they move up the hierarchy very quickly. They’re giving presentations to top executives and are extraordinarily influential. And there are never enough of them." "I think that the data scientists should take a little more economics. That would help; economics puts a lot of emphasis on the conceptual framework. And I also think that economics should be paying a lot more attention to the statistics of big data. Right now, economics as a profession has very little market share in the business analysis of this big data. It’s mostly statisticians. We’re just not training our undergraduates to be qualified for these jobs. Even our graduate students, even someone with a Ph.D. from a very good economics department really doesn’t have the right skills to analyze the kinds of data sets that big Internet firms are creating. ... We’re a little bit behind. Econometrics, at the undergraduate level, is not appreciated as much as an expertise that’s extremely important for future employment, and we certainly don’t see a lot of economics majors going on to take extra steps beyond what’s required....I really think we need to make some changes in education. What happens at the top Ph.D. programs isn’t going to really impact the overall workforce. But what we do at the undergraduate level and whether we start offering more advanced or master’s level courses becomes more important—because, really, with just an undergraduate degree it’s hard to be very successful on the technical side at any of these firms." "Companies in all sorts of different industries are starting to generate large amounts of data. The Internet companies were built from the ground up on that data. Other companies are just starting to think about what they do with the data. If you think about these kind of general purpose innovations like the computer, it took us a while to figure out what to do with the computer. It replaced the secretary and the typewriter, but it took another 15 years before the personal computer really changed the way we do commerce, which you would say really comes with the Internet and businesses being built around it." "With the big data, of course, the Googles and the Facebooks and so on were born on that. But if you take, say, a car manufacturer that might be getting real-time information from monitoring devices within the cars, there’s a first level of things you can do with that data. Like you can look at aggregate failure rates, or something, for certain types of things. You can identify problems." "But there’s a whole other level of optimizations that can be done. And I think that idea will apply across many industries. They’ll start with just the basics of, let’s figure out how to prioritize problems. For example, with software you can get telemetry data about, where are the bugs? What’s causing crashes? That’s sort of the first level of what you do with data: You use the data to identify problems and make priorities. The more frequent the crash, the higher you prioritize in fixing that problem. But there’s a next level, which includes real-time machine learning, customization, personalization, optimization, where industry as a whole is just inventing what to do with it. And there could be some really radical breakthroughs in different industries. They’re just very hard to anticipate as they start to use these data." "So if you’re thinking about how to design an auction, or how to design a market more generally, even though it can be tempting to focus on what happens once the people are in the room, it can be more important to start with designing your marketplace to get people to come, to start with. This insight is one that I’ve brought to other settings. I think, for example, it applies in online auctions. When a large company like eBay or an online advertising firm is designing its marketplace, for example, it can be more important to design your marketplace to attract bidders and make sure they’re there to participate than it is to try to extract every last cent out of them once they get there. If potential bidders are not making enough profit to make it worth their time to come, they won’t come. And thin markets can be much more problematic." "[A] profit-maximizing search engine cares how much surplus the advertisers get versus the search engine. As a result of that, a monopolist search engine will tend to raise reserve prices [meaning the lowest price they’ll accept] too high in order to extract more surplus from the advertisers even if it means eliminating ads that the consumers might have liked to see. In contrast, a competitive search engine—one that’s competing for advertisers and users—will be more likely to choose the welfare-maximizing point. A more realistic model would also incorporate the other content that gets crowded off the page by the ads; such a model would be more likely to see a monopolist search engine put up too many ads relative to what consumers would like, but again competition would typically push a firm closer to welfare maximization in order to keep both sides of the market participating." Here's an opinion piece I wrote for the (Minnesota) Star Tribune newspaper, published on Sunday, June 29. "Analogies for America: Beyond the Melting Pot"
Cato Unbound for June 2013 has a lively and provocative set of essays on "The Political Economy of Recycling." The lead essay is by Michael Munger, with comments from Edward Humes, Melissa Walsh Innes, and Stephen Landsberg. All of the essays are full of lively examples and sharp writing. Here are three examples from Munger, but these essays have many more treats in store. "Curious, I phoned the public relations officers with the recycling departments in several small cities in the Northeast. I asked one extremely cheerful and energetic young woman how her city could justify asking people to put their garbage in the dishwasher. Isn’t that pretty expensive, in terms of human time, and the energy to heat the water, compared to the value of the garbage? Using the same tone of voice one would use to talk to a five year old—she clearly thought I was not the sharpest can lid in the recycle bin—she gave me the most concise explanation I have encountered in the whole genre. She said, “Oh, you have to understand, sir. Recycling is always cheaper, no matter how much it costs!” .... The problem is that, from economic perspective, from the perspective of balancing resource use, that’s just not true. If you are trying to save energy and resources such as water and time, it never makes sense to put your garbage in the dishwasher. "The state of North Carolina, where I live, has a law against disposing of yard waste in a standard landfill. This makes some sense. Yard waste decomposes naturally and turns into compost eventually, so it can be disposed of more safely than the dangerous waste we put in landfills. But the city of Durham, where Duke University is located, decided that they would do the state one better. The city council required all citizens to dispose of their yard waste at curbside, where it was picked up by city trucks and taken to the city composting facility. "And then it caught fire. Spontaneous combustion deep inside the pile, a common result of decomposition and pressure, found enough oxygen to begin to smolder. The city tried to put it out by soaking the pile, but that just made the smoke worse. The fire could not be completely extinguished for weeks, and neighbors for miles downwind complained of the pollution. So the waste that homeowners paid extra for reusing was dumped instead in the main garbage staging facility. But remember, the law prohibits disposal of yard waste in landfills in North Carolina. So, Durham shipped all its trash, including grass clippings, to a landfill more than 85 miles away in Lawrenceville, VA. The clean-up and the extra hauling charges cost Durham an extra $1 million compared to landfill disposal." "There are two ways to think of the solution to a problem. Consider the problem of polio, a disease that killed tens of thousands and ruined the lives of millions around the world in the 1930s through 1950s. One solution was to try to ease the suffering of polio victims, developing better iron lungs and systems of braces, wheelchairs, and prosthetics to make it possible that they could live some kind of life. This industry was enormous, and highly profitable. The other solution was to develop a vaccine, the one that Dr. Jonas Salk finally perfected in 1952, and which showed itself to be effective within a decade. By the late 1960s, polio had been reduced sharply in the United States. Now, it is almost unknown here and in most of the rest of the world. Of course, the makers of braces, crutches, and iron lungs took a beating, because no one needed their products anymore. But the total costs to society were dramatically reduced, even accounting for the “loss” to the equipment manufacturers. Who will solve the problem, and how? I am a Hayekian; I have no idea. And unlike the Salk vaccine there may not be any one identifiable person or idea that solves the problem. What I do know is that if we recognize that the answer is not arguing over how to handle garbage that already exists, we have to produce less garbage in the first place. The answer may be counterintuitive, of course. Where we have reduced the amount of plastic in bottles and aluminum in cans by more than 50% in the last decade, the answer may be to increase the sturdiness of containers so that they can be reused. Instead of reducing the bulk of pallets and packages, the answer may be to make packages reusable, in the same way that shipping containers are now refilled and reused rather than melted down and reprocessed after a single use. "If we start asking the right question—not how to recycle garbage, but how to prevent garbage’s existence—we might make progress. As it stands, too many people, and too many large powerful corporations, have a financial stake in the status quo. They are making the waste management equivalent of iron lungs and polio braces."